Let's face it: we are all of us, but perhaps especially young guys, guilty of judging books by their covers. That's why books have cover art, after all, and it's why we have terrific, heated conversations about that art when it doesn't match up to reader -- or worse, author -- expectations. (An example.) It's no surprise that a book with a really kickbutt cover can gain wings to fly off the shelves, which is how Throne of Glass by Sarah J. Maas got selected for my middle school library and why I had to wait until summer vacation to get my hands on a copy. This book, its sequel (Crown of Midnight), and its collected prequels (The Assassin's Blade) proved enormously popular with my male readers, so I was imagining that it was an action-packed magical gorefest. By the time I finally got the chance to read them, I was surprised to find that these were much more feminine than I would have guessed. The heroine, Celaena, is almost disturbingly vain and girly, and the love triangle takes up a significant chunk of the story. Celaena is obsessed with her appearance and uses it like any James Bond femme fatale would -- as a weapon. And as the series progresses, things in that love triangle heat up to a degree that had me running for my roll of YA stickers. And yet, despite being clearly focused on things more commonly attributed as "girl" interests, they remain a hot commodity among my guys. There's a lot of good fighting, dark mystery, and a thread of high fantasy running through the tale. Yeah, the guys are starry-eyed for their pet assassin, but they don't stop acting like dudes -- they still fight, they still notice other girls, they do their jobs, and they don't forget to think about their guy friends. There are weapons, enchanted objects, duels, and betrayals aplenty. It also bears mentioning that this series has a prominent, powerful, female PoC character, it passes the Bechdel test, and the courting behavior of the male characters would be a pretty decent example to the young men who read it. In all honesty, this series started weak to me. 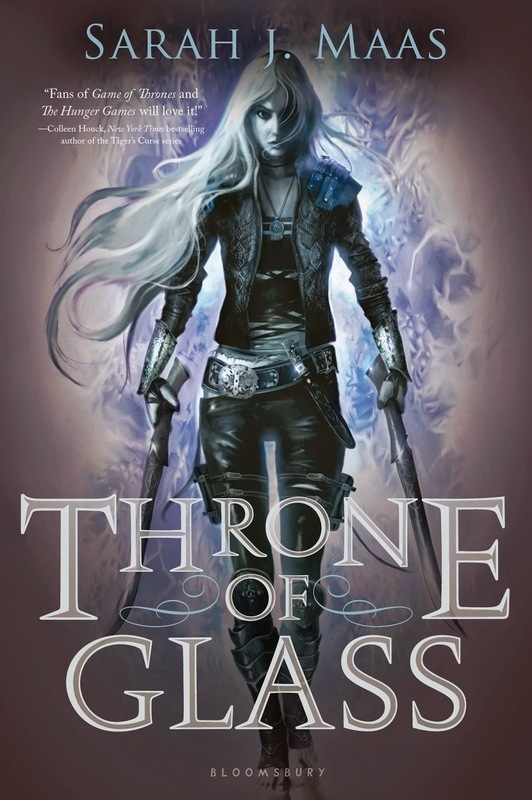 Book 1 (Throne of Glass) is kind of disjointed, with an assassin who worries about breaking her nails and a bunch of bad guys with murky motivation. Something about the characters and premise made me go back for more, though, and I am SO glad that I did. Crown of Midnight was outstanding, and left me anxious for book 3 (to be released this September; Maas anticipates writing 6-7 in total, thus breaking the oh-so-common Rule of Three in YA literature). The prequels were surprisingly good as well, and did a lot to round out Celaena's character development. I'd recommend this series for teens and young adults, probably grade 8 and older. Guys and gals alike will find something to love about these books. Oh, I'm so glad this series improves. I made it through the first book and had made the call to leave it -- but I'll give it another shot. Yes, interesting to hear that! I have the first book, but it didn't really grab me--I couldn't figure out if I just maybe wasn't in the mood for it at the time.